Voting paradoxes occur in particular profile domains. For the avoidance of the paradoxes it is therefore important to know if the profiles typically encountered in practice are of such nature that the paradoxes are very unlikely or downright impossible. Ever since the publication of Arrow’s theorem, the role of domain restrictions has been appreciated. However, the earlier studies have mainly focused on conditions for rational collective choices through pairwise majority comparisons. In those studies the single-peaked preferences have been found to be an important type of preference similarity that guarantees complete and transitive collective outcomes. This booklet introduces and analyzes a similar preference restriction, viz., the existence in the profile of a Condorcet winner that is elected by the procedure under study. 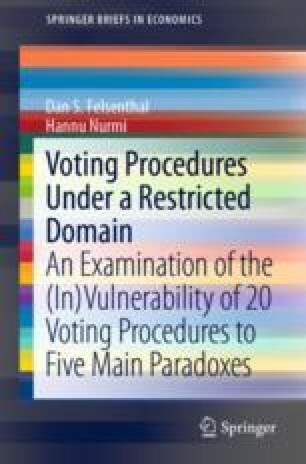 We examine the possibilities of various voting procedures to end up with voting paradoxes under these restricted domains. Thereby we refine the results that establish the vulnerability of some procedures to various kinds of voting paradoxes.